The world development institutions commonly present 'urban governance' as an antidote to the so-called 'urbanisation of poverty' and 'parasitic urbanism' in Africa. Governance for Pro-Poor Urban Development is a comprehensive and systematic analysis of the meaning, nature, and effects of 'urban governance' in theory and in practice, with a focus on Ghana, a country widely regarded as an island of good governance in the sub region. The book illustrates how diverse groups experience urban governance differently and contextualizes how this experience has worsened social differentiation in cities. This book will be of great interest to students, teachers, and researchers in development studies, and highly relevant to anyone with an interest in urban studies, geography, political economy, sociology, and African studies. "…I consider this work a testament of exemplary scholarship. The analyses and arguments are clear while the surveys are insightful and workmanlike. The closing commentaries and conclusions are logical, insightful and especially informative. I find the content and presentation to be original and constitute a significant contribution to the extant body of knowledge on the political economy of urbanization not only in Ghana but also Africa and the developing world in general." – Ambe J. Njoh, Professor of Urban and Regional Planning, University of South Florida, Tampa, Florida, USA. 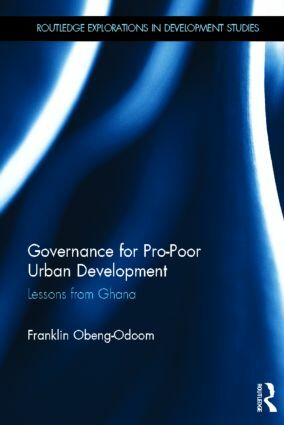 "Given the recent emphasis on and popularisation of the concept of urban governance, this [book] makes a substantial and original contribution to debates on its usefulness and its effectiveness, notably through the detailed case-study of Ghana and through the application of a political economy perspective by which to undertake the analysis and evaluation. An important aspect of this originality is the development of an appropriate analytical framework through combining elements of institutional and Marxist political economy." – Gordon Crawford, Professor of Development Politics, University of Leeds, UK. Franklin Obeng-Odoom is an urban researcher at the School of the Built Environment at the University of Technology, Sydney where he is the Chancellor's Postdoctoral Research Fellow. In January 2013, he was appointed by the International Social Science Council as a World Social Science Fellow for work on sustainable urbanisation, three years after becoming a Dan David Scholar for 'innovative and interdisciplinary research that cuts across traditional boundaries and paradigms'. His research interests are in political economy of cities and natural resources especially water, oil, and land, and political economy of development. Franklin's research has appeared in Review of African Political Economy, The Review of Black Political Economy, and Review of Social Economy, Regional Studies, Cities, and Housing Studies. He is Associate Editor of African Review of Economics and Finance and Journal of Sustainable Development, and the Book Review Editor of Journal of International Real Estate and Construction Studies. In addition he serves on the editorial board of Urban Challenge (Urbani Izziv).